No cross-reactivity to carbonic anhydrase II. This product was prepared from monospecific antiserum by a delipidation and defibrination. Our Abpromise guarantee covers the use of ab6618 in the following tested applications. WB 1/1000 - 1/5000. Predicted molecular weight: 29 kDa. WB using ab6618. Review by Morena Cobbs submitted 7 January 2004. Publishing research using ab6618? Please let us know so that we can cite the reference in this datasheet. Have you a protocol or reference for ELISA on human erythrocyte carbonic anhydrase 1(CA1) using your antisera ab6619 or ab6618. 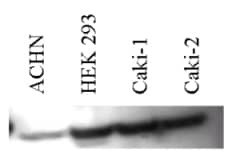 I want to develop an Elisa assay for CA1. Which antisera do you recommend. Is it possible to receive a sample for evaluation for my student's research project. Dear Asif We do not have references yet for either of these antibodies. I suggest using the general protocol for ELISA given in the resources section of the website. 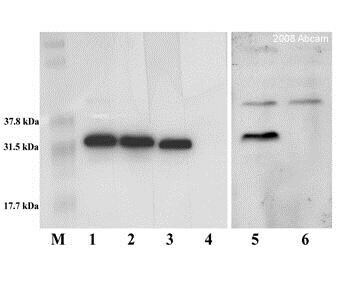 These two ab numbers are different forms of the same antibody, ab6618 is whole antisera and ab6619 is purified IgG. In general I would expect the purified IgG to give a better result. Our policy at Abcam is that if an antibody does not work as specified on the datasheet, we offer a replacement or reimbursement. We do not routinely offer free samples. We also offer a USD20 Amazon gift voucher to researchers who feedback information about our products. I'm looking for antiserum (or purified polyclonal antibody) raised in a goat or rabbit innoculated with sheep red blood cells (erythrocytes). I need the rabbit/goat anti-sheep erythrocyte to use as a positive control to observe antibody-directed complement lysis of sheep erthyrocytes. (ie complement will lyse erythrocytes coated with antibody). I tried to do a search using erythrocytes as the key word, and came up with Carbonic anhydrase I. It looks like this was raised using carbonic anhydrase obtained from human erythrocytes. Do you have anything else that is specific to an antigen expressed on the surface of a sheep erythrocyte? Or simply antiserum raised against sheep erythocytes? You could try looking for CD44 antibodies.